Following the success of the “Biblical and Qur’anic History” tour of the British Museum, I’d like to present this blog post about the history of Satan. Satan the Devil has been a feature of Judaism, Christianity and Islam (known in those faiths as “ha-satan”, “Satan”, “Devil”, “al-Shaitan” or “Iblis”) for over 2000 years. He is most often portrayed as an irredeemably evil spirit creature bent on inducing humans to sin against God. He takes the form of an angel with bat-like, rather than bird-like wings, a horned goat-like creature with a trident and even a multi-headed dragon. Due to this vivid imagery, Satan the Devil is a powerful archetype of evil in Western society, but not many people know that the present-day idea of Satan as an entity of pure evil is not how this character has always been seen. This article is designed to get to the root of how Satan the Devil came to be seen in this way. “Devil” appears in the Bible 61 times, and all references are found in the Christian New Testament. Other words include Lucifer, Abaddon, Beelzebub and Belial, but we are only going to focus on the word “Satan” for this first article. You may have noticed that the title of this article calls this character “the satan” rather than “Satan”. This is deliberate. As we will see, the Christian concept of the Devil is very different from what the original writers of the Hebrew Scriptures had in mind when they talked about “the satan”. “Satan” is a Hebrew word, and it appears in the Bible 56 times; 38 times in the Christian New Testament and a mere 23 times in the Masoretic text of the Jewish Tanakh (which Christians call the Old Testament). Of the 38 times that it appears in the Christian New Testament, it is always a proper noun, “Satan”, the personal name of the familiar evil creature. This article is going to focus, though. not on the New Testament and its 61 Devils and 38 Satans, but on the 23 satans of the Jewish Tanakh (known to Christians as the “Old Testament”). In this series of articles, we will see why the word “satan” is so little used in the Tanakh and why it becomes such an obsession in the New Testament (which is around a tenth of the size of the Tanakh but contains more than 81% of the references to that wicked creature) and in the Qur’an. You may also have already noticed that I’ve been referring to “the satan” or “satan” with a lower-case letter, rather than “Satan”. This is because in the Tanakh, “the satan” is not always a proper noun referring to an individual person but a common noun meaning “adversary”, “opponent” or “prosecutor”. It is derived from a verb meaning “to obstruct, oppose, prosecute (in the legal sense)”. The definite article in English is the word “the”, and it takes many forms in Hebrew, one of which is “ha-”. Without the definite article (“satan” or “a satan”), the word can refer to any kind of opposer or prosecutor, human or spirit, and with the definite article (“ha-satan), it refers to a specific entity “the Adversary”, “the Opponent”, “the Prosecutor” or “the Accuser”. Strangely, in two of those instances, “Satan” seems to be referring to Yahwéh himself. In the examples from Numbers 22:22 and Numbers 22:32 above, Yahwéh himself is “a satan” toward Balaam (the “angel of Yahwéh” often means the presence of Yahwéh himself). Religious apologists usually say that Yahwéh himself was testing, prosecuting or accusing his own people. There is merit in this view depending on your theological stance, especially a theological stance that tries to tie all loose ends together. However, another, in my option, the Bible is not a book, but a collection of writings by a group of people with very disparate worldviews, backgrounds, biases and motivations. A more realistic interpretation of this, is that the conception of who God was changed over time by authors who had a different point of view about the divine. The pre-exilic Deuteronomistic writers of Samuel had no problem mentioning that Yahwéh could act capriciously (Samuel was composed and edited several times between 715-550 BCE), but by the time writers of Chronicles penned their book (most likely in the post-exilic period 350–300 BCE), the conception of Yahwéh had changed from a more flawed and human character who walked directly with the patriarchs, got angry and regretted mistakes, to a majestic and lofty deity who is infinitely perfect in every action. Some even believe that the priestly elite that had re-migrated from Babylonia wanted to replace wholesale the entire Deuteronomistic History (Deuteronomy, Joshua, Judges, Samuel and Kings) with the books of Chronicles, thereby covering-up negative references to Yahwéh and instead framing what had come to be seen as the unfair punishment of David as something carried out by someone other than Yahwéh. Who better than the perennial scapegoat, ha-satan? A coin from Gaza in Southern Philistia, fourth century BC, the period of the Jewish subjection to the last of the Persian kings, has the only known representation of this Hebrew deity. The letters YHW are incised just above the hawk(?) which the god holds in his outstretched left hand. Isaiah 45:7: I form light and create darkness; I make prosperity and I create calamity; I am Yahwéh who does all these things. Ezekiel 20:25–26: Moreover I gave them statutes that were not good and ordinances by which they could not have life; and I defiled them through their very gifts in making them offer by fire all their first-born, that I might horrify, them; I did it that they might know that I am Yahwéh. Yahwéh was at first said to bring both good and bad and early Judahite and Israelite people didn’t see any contradiction in that. After all, Yahweh made humans in His image, and they were capable of both good and bad, and as Yahwéh alone controlled all events and was responsible for all conditions within creation, it was not seen as incongruent. It’s not dissimilar to how the Babylonians conceived of their gods. Ira Spar from the Department of Ancient Near Eastern Art, The Metropolitan Museum of Art remarked “[the Babylonian gods] were considered to be unpredictable and oftentimes capricious. Their need for food and drink, housing, and care mirrored that of humans”. Yahwéh too acts capriciously when bringing the Flood, smells the sweet smell of animal sacrifices and resides in a physical tabernacle or temple. The juxtaposition of 2 Samuel 24:1 and 1 Chronicles 21:1 shows us that ha-satan may well have been just a manifestation of the way Yahwéh tests his followers rather than a separate entity. However, later, we begin to find more references to ha-satan, with the article, referring to a specific supernatural entity “the accuser” or “the satan” in other, later verses. Satan seems to be a person in his own right rather than an avatar of Yahwéh. In Job, ha-satan is pictured as a heavenly prosecutor or accuser, a member of the divine council, the court of Yahwéh. He functions as a kind of prosecuting attorney, a role which was found throughout ancient Near Eastern court systems. He tests the loyalty of Yahwéh’s followers by forcing them to suffer like Job did. In Zechariah 3, ha-satan is pictured as standing at the right side of the angel of Yahwéh making accusations against Joshua the High Priest. It is his job to observe the behaviour of Yahwéh’s people and report any perceived shortcomings. So looking at all these verses, ha-satan’s express purpose, his job, was originally to prosecute the nation of Judah in the heavenly court and test it to see if it will continue to serve Yahwéh even in adversity. The satan is an entity under the command of Yahwéh but its existence helps to distance Yahwéh from taking responsibility for the negative and evil experiences that humans experience in this world. Ha-satan was, therefore, the early Hebrew answer to the theodicy, the question of why god, or the gods, allow humans to suffer. However, at some point in history, the Hebrews began to elevate their god to such a lofty position that it was unthinkable that he actually would or could create any sort of calamity. A scapegoat was needed and that took the form of ha-satan, the Prosecutor. Originally viewed an agent of Yahwéh, the Prosecutor became seen as a separate entity with its own goals, working independently of Yahwéh and often against him. But the reputation of ha-satan was to be sullied further. At some point in the evolution of ancient Hebrew religion, Yahwéh could no longer do any wrong and the satan was loaded with more negative qualities. Why did this change take place? The idea that Yahwéh controlled all aspects of life, good and evil, soon became quite frustrating and brought about the concept we know as “theodicy”: How could a loving and benevolent God allow so much suffering and pain on earth? After the Babylonian exile, Judah was politically rebuilt as a Persian “satrapy”, a semi-autonomous administrative province, ruled by a priestly elite that had re-migrated from Babylonia and whose views and attitudes were shaped by the plans for the reconstruction of Judah drafted during the exile. They were at odds with the local population, rigorously enforced separation from the mixed multitude of inhabitants of Judah, and ruled on the basis of the Torah. This code of law was promulgated by Ezra in the early 4thcentury BCE and it served as the legal ideal of a theocratic state (ruled by priests rather than kings). According to the later rabbis, the institution of the Torah as the basic law brought the earlier institution of prophecy to an end. The contact between the Judahites and the Persians from 539 BCE onwards led to the Jewish religion being reformed in the image of Zoroastrianism. Angra Mainyu was the Persian embodiment of the evil “destructive spirit” who is omnimalevolent and is the twin brother and chief adversary of the Zoroastrian god Ahura Mazda. The Middle Persian equivalent is Ahriman. This dualistic theology seeped into Judeo-Christian and Islamic religion, not only in the aposition of God-Satan but also of Good-Evil, Heaven-Hell and Body-Soul (pre-exilic Yahwism had only a rudimentary concept of the afterlife, and may have believed that the body and the soul were one entity). The Persians’ religion Zoroastrianism used Avestan terms such as daebaaman (deceiver) and paitisha (opponent) to describe Angra Mainyu which hark back to not only the Jewish epithet of ha-satan (adversary, opponent), but also that of later Christian theology (“diabolos”, from which we get the word “devil” meaning deceiver). The coincidence leads us to a very compelling conclusion that the Jews recognised this character and synchronised their ha-satan with Angra Mainyu. Angra Mainyu was a dragon-like beast with horns and forked tongue and a tail, an image which had been previously alien to the Judahite people. This demonised version of ha-satan is the one that became incredibly popular in the intertestamental period, with many of the Jewish writers of the Biblical Apocrypha using this Satan as the source of all evil in the world. The intertestamental period (the period between the ministry of Malachi (c. 420 BC) and the appearance of John the Baptist in the early 1st century AD) is when the full characterisation of this new “Satan the Devil” comes into full fruition. In this period, probably due to Persian and then Greek influence, the Jews became obsessed with messianic prophecy, end-time predictions, obscure allegory, hidden books and spirit creatures (a trend which started in the books of Ezekiel and Daniel and continued until Revelation’s climax and beyond). 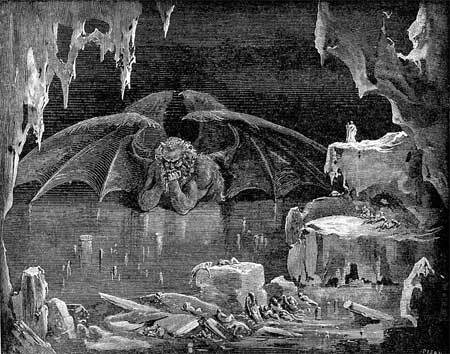 In the second part of this article, we’ll take a closer look at the Devil in the Intertestamental and Christian periods. Lawrence H. Schiffman, From Text to Tradition. A History of Second Temple Rabbinic Judaism (Hoboken: Ktav, 1991), Martin S. Jaffee, Early Judaism (Upper Saddle River/NJ: Prentice Hall, 1997). Winn, Shan M.M. (1995). Heaven, heroes, and happiness : the Indo-European roots of Western ideology. Lanham, Md. : University press of America. Vitz Law Firm (2014) Satan Was a Prosecutor. Jesus was a Defense Lawyer.